Tampa Bay Brewing Company | Eat It, Damn It! When MG & I booked our trip to Florida, it was my job to look for places to dine. MG is a big fan of a certain spikey-haired fellow who hosts a show on a gastronomy centered television network (no free advertisements folks). This blonde fellow has visited a number of restaurants in Tampa and St. Petersburg. One such place was the Tampa Bay Brewing Company. Located in the heart of Ybor City, we had a little trouble finding the restaurant. It is kind of tucked back from the main street. Just look for the outdoor bar. The main restaurant is located right behind. We were there on a Friday night at 6:30pm, prime dinner hour. We had to wait for about 15 minutes. We would have taken seats at the bar, but that too was filled. 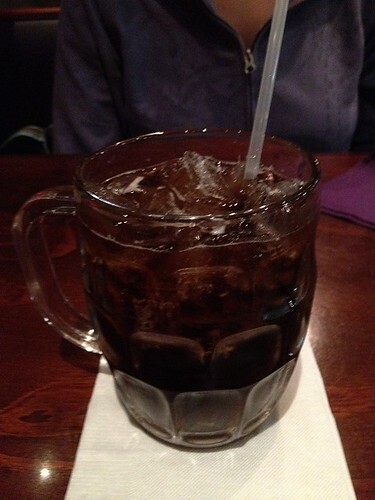 MG does not drink beer, so she got a root beer ($1.99). I’m not sure if they make it in house or if they buy a particular brand. It was pretty good, not very sweet and possessing a little bite. I have no qualms about drinking beer. 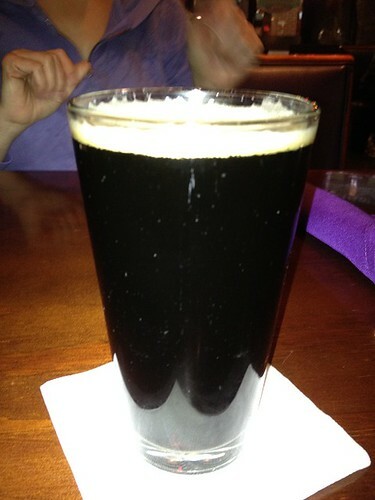 Our waiter recommended the Jack the Quaffer Porter ($4.00). According to him is has a low alcohol content resulting in a smooth and easy-drinking beer. The taste of hops was pretty strong. Fans of slightly bitter beers might want to give it a shot. I liked it, but it did not bowl me over. We asked our waiter which wings to try. He asked, “Do you like buffalo wings or barbeque wings?” Buffalo. 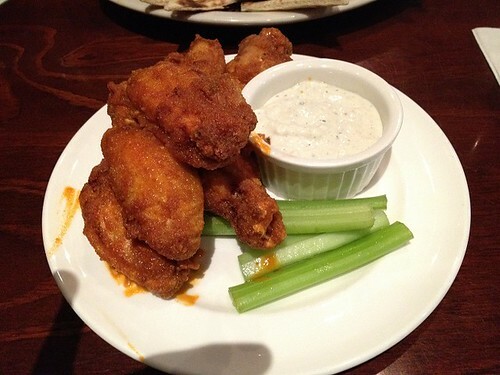 On his suggestion we tried the Brew House Cider Wings ($8.99). They were very meaty and well cooked, but did not have much kick. They were tasty, but not exceptional. What was exceptional was the blue cheese dipping sauce that accompanied the dish. The sauce was good and funky with plenty of flavor, not just mayo combined with chunks of cheese. The hummus ($7.99) was fine, but nothing to write home about. Like most of the other items on the menu, this was made with some form of beer (in this case, True Blonde Ale). It was creamy, but not exceptionally so. It was tasty, but again, not especially so. 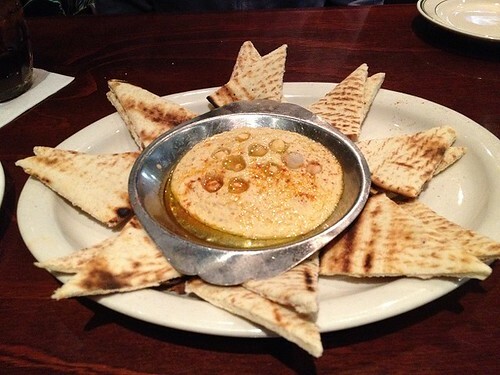 If you’re really in the mood for hummus, you could do worse, but I wouldn’t go for it again. 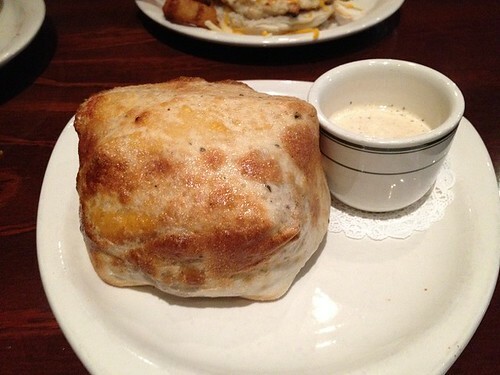 I ordered what looked to be one of the more unusual items on the menu, The Bomb ($10.95). 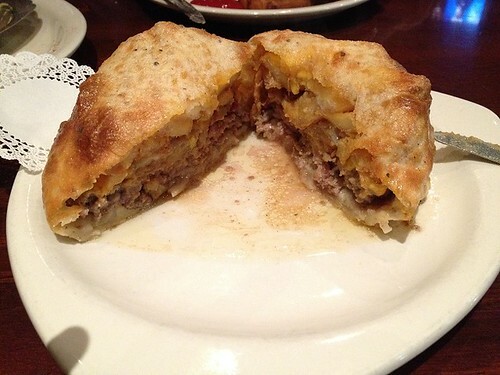 It is advertised as “1/2 pound burger with bacon, cheddar, french fries and onion rings wrapped in our own pizza dough and finished with a side of our horseradish ale sauce”. Intense, right? Just look at that thing. My eyes popped open wide when our waiter set it on the table. He suggested that I cut it in half to let the steam out so that I would not burn myself. Check out the inside. It is quite the culinary feat/oddity. Sadly, I was not bowled over by this dish. Don’t get me wrong, it was pretty good, but just go back and read the description again. I was expecting to be overwhelmed with flavor, but the Bomb didn’t quite launch me into flavor country. The burger itself was on the bland side. The fries didn’t add much to the proceedings. However, once I added the horseradish sauce, the taste improved considerably. MG got the Chile Roja Bison Burger ($12.50), but opted to go with chicken instead of beef. It’s topped with avocado sour cream, homemade salsa and cheddar jack. She declared it “Blah.” The onion rings were very tasty on the other hand. They were crisp and nice, not oily at all. 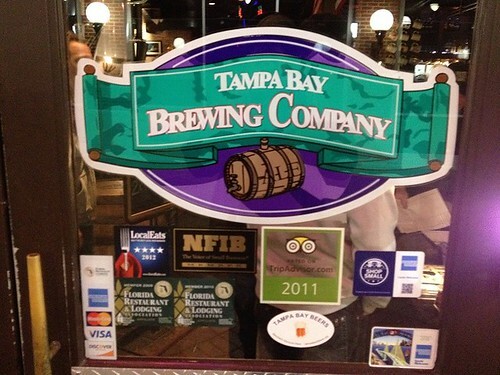 The Tampa Bay Brewing Company is a nice place, but not a must-stop destination. If you are going to try out a bunch of different beers and need a bite to eat, it would be a great destination. However, if you are looking for a spectacular dining experience, I don’t think that it fits the bill. 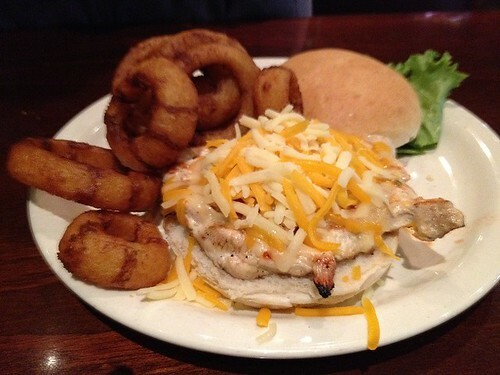 They serve pub food with a twist, but not necessarily a great twist.